When you add a filter to a worksheet, by default it applies to the current worksheet. Sometimes, however, you might want to apply the filter to other worksheets in the workbook. You can select specific worksheets to apply the filter to or apply it globally to all worksheets that use the same data source or related data sources. For example, you might have a filter that only includes a specific region or product of interest. Rather than adding this filter every time you create a new worksheet, you can simply create the filter once and then apply it to multiple worksheets. Watch a Video: To see related concepts demonstrated in Tableau, watch these free training videos: Additional filtering topics (7 minutes), Ways to Filter (2 minutes), Where Tableau Filters (4 minutes). Use your tableau.com account to sign in. For more examples of global filters, also see The Global Filters Tab on Ryan Sleeper's website, and Dashboard Design: Adding Interactivity on the Interworks blog. This option applies the filter to all worksheets that use related data sources as their primary data source. Note: To apply a filter to worksheets that use a related primary data source in web authoring, relationships between the data sources must be set up in Tableau Desktop, and then published to the web. For more information, see Filter Data Across Multiple Data Sources. On the Filters shelf, right-click the field and select Apply to Worksheets > All Using Related Data Sources. Filters that use this option are global across the workbook. Filters that apply to all related data sources are marked with an icon. The filter is automatically created on any existing worksheets, and on any new worksheets you create that use a related data source. Any changes you make to the filter affects all of those worksheets. This option applies the filter to all worksheets that use the current worksheet's primary data source as their primary data source. On the Filters shelf, right-click the field and select Apply to Worksheets > All Using This Data Source. Filters that apply to all worksheets are marked with a data source icon . The filter is automatically created on any new worksheets you create after you drag a field to the view. Note: If you are blending multiple data sources in a view, All Using This Data Source adds the filter to all sheets that use the same primary data source in the current sheet. The sheets that the filter gets applied to is not based on the filter field’s data source. This option opens a dialog box where you can select from a list of worksheets that use the same data source or related data sources. On the Filters shelf, right-click the field and select Apply to Worksheets > Selected Worksheets. 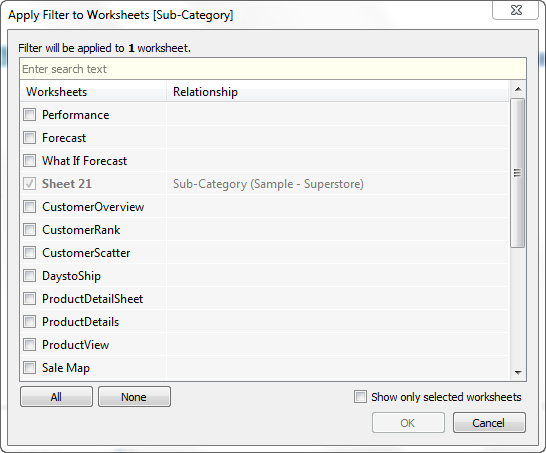 In the Apply Filter to Worksheets dialog box, select the worksheets that you want to apply the filter. If any of the sheets already contain a filter on the same field, the dialog box will provide details about the filter. If you select the sheet, the current filter will override any existing filter selections. This option only applies to the current worksheet. This option is selected by default when you create new filters. Filters that are local to the current worksheet are shown without any additional icons. On the Filters shelf, right-click the field and select Apply to Worksheets > Only This Worksheet. If you apply a filter to all worksheets or selected worksheets and then change the setting to apply the filter to just the current worksheet, the filters are not removed from all other worksheets. Rather, the filters are disconnected and they are all made local to their respective worksheets. You can go to each worksheet and remove the filter or modify selections.